Our Level 1 Award in Skills for Employment, Training and Personal Development Route 3 – Sports/Coaching, which started on the 14th April in Coleraine has been a great success with all participants. One of the young men attending had turned down all other previous courses and had changed his mind about doing this course after completing our Hi speed manual handling course. He said he was surprised by how much he learnt. This positive experience had given him the confidence to try something more challenging to further develop his skills. 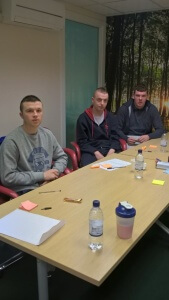 This course has been a great way of helping these young men develop friendships with one other and build up their confidence to deal with new social situations and become more engaged in what our Community Family Support Programme has to offer them.